San Francisco-based non-profit Rainforest Connection has created a unique, technologically advanced system to defend the rainforests of Brazil. The high-tech protection system incorporates machine learning and solar energy to operate sensor devices called Guardians that listen to the rainforest and send real-time messages if illegal logging activity is detected. Built out of modified cellphones, the Guardians are placed high in the canopy. The solar panels mitigate the need for battery changes or maintenance. 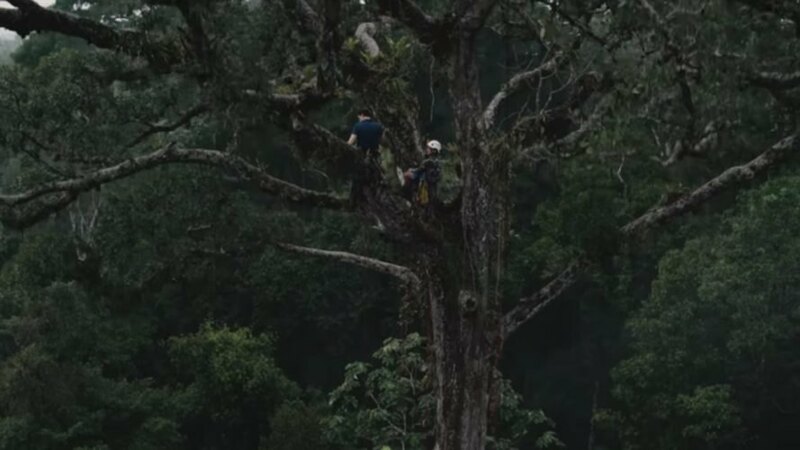 With assistance from Google, Rainforest Connection has focused their efforts on the Amazon Rainforest in Pará, northern Brazil, where they have also collaborated with the local Tembé people, who are defending their homeland from encroaching logging. About 30 members of the Tembé people regularly patrol the forest to repel illegal loggers. Even with refined knowledge of the local environment, the Amazon Rainforest is difficult for anyone to navigate. Up in the canopy, the Guardians capture sounds, which are then sent to Rainforest Connection. The company recently announced it will be using Google’s TensorFlow tool, which facilitates the use of machine-learning software by other companies. The sounds are then analyzed so that the location and origin of the sounds can be determined. Workers install Guardian devices in the high canopy. Chief Ednaldo Tembé speaks of the devastation brought to his home by deforestation. Two men paddle along the Amazon River. A close-up of the solar panels that power the Guardian.